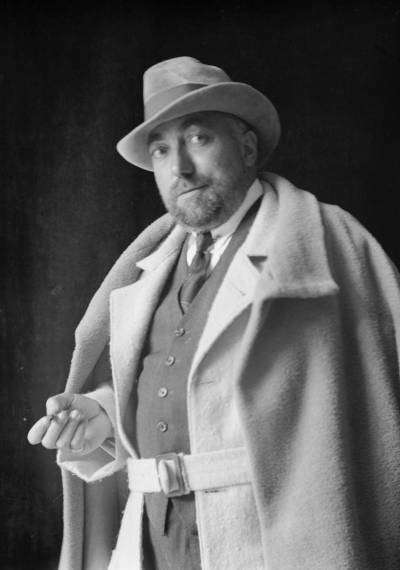 In his autobiography, the remarkable Paul Poiret says: "It was in my inspiration of artists, in my dressing of theatrical pieces, in my assimilation of and response to new needs, that I served the public of my day." And you can see, in his designs, that Paul Poiret was a groundbreaking and very influential figure in the world of fashion, leaving a legacy that still reverberates through fashion to this very day ~ and all the more remarkable given that he was designing nearly a hundred years ago, in the roaring 20s, to which he contributed a vast amount of new direction in the way fashion evolved. Every decade has a designer who, above all others, is able to divine and define the desires of women. 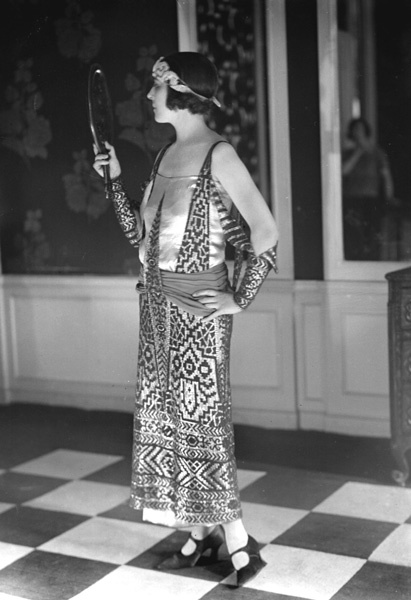 In the 1910s, when he started designing, this oracle of the mode was Paul Poiret. Paul Poiret was a world famous French couturier who bought innovative ideas, new vision and the most sensational exotic, exciting and unheard of designs to the fashion world and a new emerging era. He was known in America as "The King of Fashion" and “Le Magnifique” in Paris. "Fluid" was the word used to describe the first impressions of the “Paul Poiret: King of Fashion" retrospective exhibition on view at The Metropolitan Museum of Art in New York in 2007. There were no pinched waists and exaggerated posteriors and corseted, constricted figures which are so associated with the eras before the 1920s. The colours and textures recalled harems and "A Thousand and One Nights" ~ but the gorgeously attired women were clearly emancipated. Reading the dates of when the gowns, coats and accessories were created (1879-1944) came as a shock to many visitors, because so many of the designs could be worn today. They must certainly have set tongues on fire in their day!!! Poiret was famous for working closely with artists who became indispensable collaborators, including the very well known Raoul Dufy ~ who was known for his flat, graphic patterns which Poiret incorporated into many designs. Poiret said, that for him, art and fashion were one ~ and he strived in his work, successfully, to realise this dream he had of a unity between the two, a seamless fusion. Today, looking at Poiret’s designs you can clearly see that they are indeed wearable art. As well as presenting himself as an artist and patron of the arts, Poiret promoted his fashions as unique and original works of art in and of themselves and worked to develop the romantic and theatrical possibilities of clothing. Poiret used many luxury fabrics in his creations, including most famously, lace, chiffon, metallic lame, silk, velvets and brocades. Poiret was greatly influenced by oriental costumes, especially by Diaghilev's Ballets Russes and also by exotic oriental tales such as 1001 Arabian Nights. He had seen the Diaghilev/Ballets Russes production of Schéhérazade where the costumes had been designed by the Russian artist Léon Bakst, and Poiret loved their Orientalist fervour. All in strong, many-spiced colours and metallic golds and silvers recalling the East and the Byzantine ~ and he determined to design things that had similar exotic and oriental vision. Even when Poiret reopened his fashion business after World War I, during which he served as a military tailor, orientalism continued to exercise a powerful influence over his creativity. By this time, however, its fashionability had been overshadowed by modernism. Utility, function, and rationality supplanted luxury, ornament, and sensuality. Poiret could not reconcile the ideals and aesthetics of modernism with those of his own artistic vision, a fact that contributed not only to his diminished popularity in the 1920s but also, ultimately, to the closure of his business in 1929. However, at the height of his popularity and fame, and though perhaps best known for fusing fashion and art, for freeing women from corsets, and for his startling inventions including the ‘hobble’ skirts, ‘harem’ pantaloons, and ‘lampshade’ tunics, Poiret's major contribution to fashion was his development of an approach to dressmaking centred on draping, a radical departure from the tailoring and pattern-making of the past. Poiret was influenced by antique and regional dress and costume, most notably by the Greek chiton, the Japanese kimono, and the North African and Middle Eastern Kaftan, and he favoured clothing cut along straight lines and constructed of rectangles. Along with other groundbreaking designs never seen before, Poiret introduced the ‘chemise’ in 1910. While he had already set corsets aside ~ the emancipation of the female body was now complete with the "T" shaped dress. Poiret's chemises were even more reductive than the undergarments that were their inspiration. Front and back were cut identically, with no darts for the bust, shaping of shoulder seams, or inserts. It has been said by fashion historians and modern designers alike that the structural simplicity of his clothing represented a pivotal moment in the emergence of modern fashion generally, and that Poiret irrevocably changed the direction of costume history. Among Poiret’s clients were the influential, the infamous, the talented, the rich and the beautiful ~ they included the art collector, bohemian and socialite Peggy Guggenheim; Sarah Bernhardt who was considered the most famous actress the world has ever known; the infamous Lillie Langtry; the acclaimed dancer Isadora Duncan; the world famous singer, dancer, actress, entertainer and civil rights activist Josephine Baker; the French actress & singer Mistinguett who was at one time the best paid entertainer in the world: the heiress, writer and political activist Nancy Cunard; cosmetics magnate and one of the world’s richest women Helena Rubinstein; French novelist Colette, and Elsa Schiaparelli, regarded as one of the most prominent fashion designers between the wars. In time, though, as with all fashion, the popularity of Poiret's designs waned. World War I reduced his extraordinary empire. 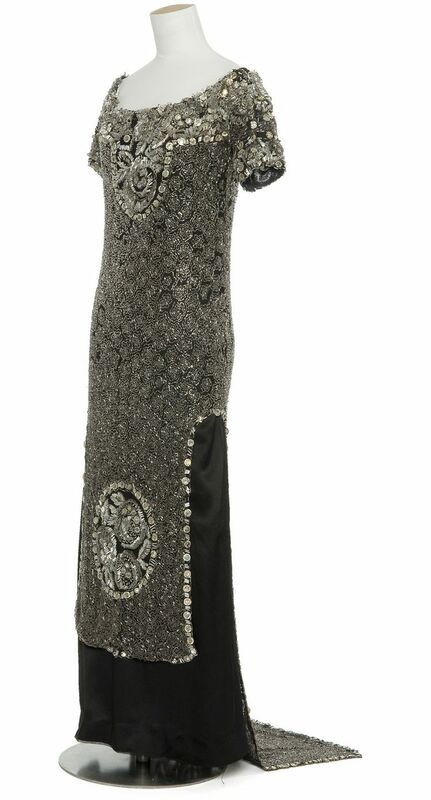 The 1920's came, and fashion ideas changed, helped along by the arrival of Coco Chanel. Poiret and Chanel met once when Chanel was very young and Poiret's fame was in decline. Noting the simplicity of the simple black dress she was wearing, one of her latest designs, he asked her for whom she was in mourning. "For you, Monsieur Poiret," she replied. Paul Poiret’s legacy lives on to this day ~ an inspiration to generations of world famous designers who still recognise him, to this day, as having enduring ideas and breath taking, groundbreaking vision which many say are still as relevant today as they were a hundred years ago. Poiret’s designs are now extremely rare and sought after by collectors as much loved additions to their collections ~ and by celebrities, models and fashionistas for wearing at red carpet and other special events. With another revival of interest in all things 20s, genuine 1920s dresses are becoming almost impossible to find ~ one as exceptional as the one we are offering here is almost unheard of ~ and in such amazing totally wearable condition!!! Raoul Dufy was a well known French Fauvist painter. Dufy's oils and watercolors often depict events of the time, including yachting scenes, sparkling views of the French Riviera, chic parties, and musical events. He developed a colourful, decorative style which became fashionable for designs on ceramics and in textiles (of which he produced a huge number), as well as for decorative schemes for public buildings. He was also a draftsman, printmaker, scenic designer, furniture designer and muralist. Dufy also acquired a reputation as an illustrator and as a commercial artist. In 1909, Raoul Dufy was first commissioned by Paul Poiret and after 1912, Dufy designed textile patterns for use in Poiret's garments ~ setting up a small factory in about 1911 to design and print fabrics for the then increasingly well known Paris couturier. Poiret wrote of his collaboration with Dufy: "Am I a fool when I dream of putting art into my dresses, a fool when I say dressmaking is an art? For I have always loved painters, and felt on an equal footing with them. It seems to me that we practice the same craft, and that they are my fellow workers." Among Poiret's various collaborations, the most enduring was with Raoul Dufy, whose career as a textile designer he helped launch. Dufy's flat, boldly graphic patterns were ideally suited to Poiret's abstract designs and bold and sensual shapes. We do offer payment by layaway / instalments on this item ~ please message us to enquire. Below: Artist Raoul Dufy's design for Poiret's perfume label ~ Dufy designed many of Poiret's fabrics ~ incredibly similar to the Art Nouveau / Art Deco stylised flowers on this dress. Above : 'Les Arums' Fabric designed by Raoul Dufy in 1919.